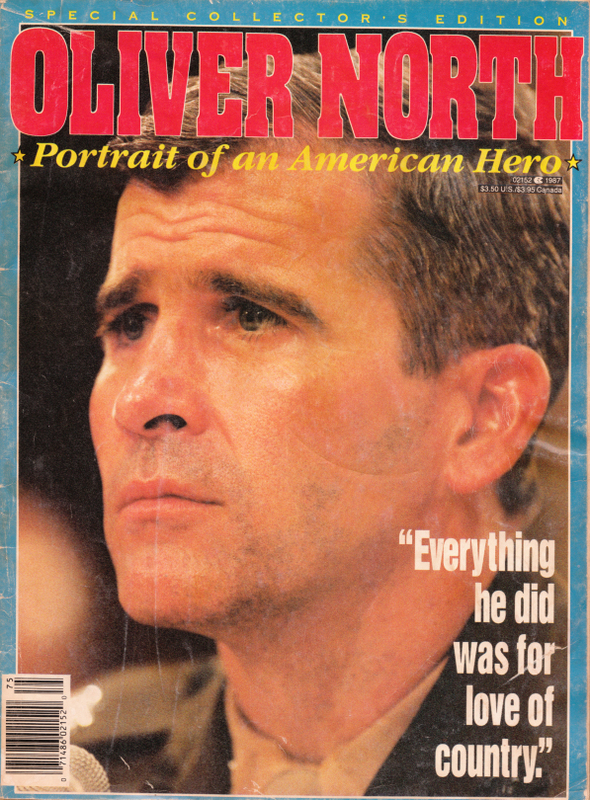 What: A “Special Collector’s Edition” magazine called Oliver North: Portrait of an American Hero. Where: Purchased in 1987 for $3.50 at an Eagle supermarket in northern Illinois. Why? : Yes, it’s true, almost half of all Americans at one time were hot for Ollie North. Animated by quick money and a my-country-right-or-wrong faux patriotism, it’s a quiet production compared to what today’s right wing noise machine produces. He took pride in the things he did. He displayed an eagerness to be deceitful in doing the things he did. This moral quandary is resolved through a curious process whereby “the truth” is “as he saw it.” His eyes, his eyes. He dodged responsibility for his actions by loudly and proudly proclaiming a willingness to accept responsibility for his actions. Oliver North is more than an American hero. He is the epitome of American truths. He was not lying when he said this is a dangerous world. … Give us more men [italics in original] like Lieutenant Colonel Oliver North and we will once more have a safe world where Americans can live and travel freely. I was thinking that I would join the Air Force when I grow up. … After watching Lt. Col. North on television, I now think it would be neat to be a Marine. I realized just how complicated this world is. And dangerous. It’s true that our politicians should be honest with us, but when national security is threatened, it is time to be quiet and act. Allen Halperin of Los Angeles, CA, an ex-Marine who volunteered to fight in Vietnam, argued that “Americans take for granted” “many freedoms,” such as the “the freedom to choose what we do, say, read, and write.” Clearly, Mr. Halperin’s service to his country endowed him with the super-heroic ability to know when the GCR Publishing Group, Inc., would be coming out with a “Special Collector’s Edition” celebrating the heroism of North, and that’s why he was able to share his important insight about our unique American freedom to write what we want. In his entry for August 9, 1985, North summarizes a meeting with Robert Owen (“Rob”), his liaison with the contras. They discuss a plane used by Mario Calero, brother of Adolfo Calero, head of the FDN, to transport supplies from New Orleans to contras in Honduras. North writes: “Honduran DC-6 which is being used for runs out of New Orleans is probably being used for drug runs into U.S.” As Lorraine Adams reported in the October 22, 1994 Washington Post, there are no records that corroborate North’s later assertion that he passed this intelligence on drug trafficking to the U.S. Drug Enforcement Administration. North tells Poindexter that Noriega can assist with sabotage against the Sandinistas, and suggests paying Noriega a million dollars — from “Project Democracy” funds raised from the sale of U.S. arms to Iran — for the Panamanian leader’s help in destroying Nicaraguan economic installations. CIA planes shipping drugs (out of New Orleans); rehabilitating Noriega’s image so he could finance terrorist acts against Nicaragua; training Afghani rebels. What could go wrong? 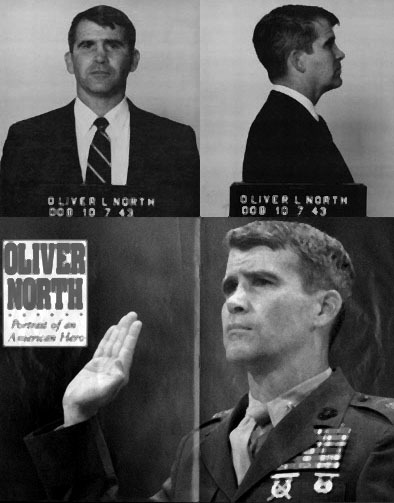 But back to Oliver North: Portrait of an American Hero. Who would put out such a thing? It must be some Koch Brother type, right? Maybe one of those Swift Boat dudes? Rupert Murdoch? Mr. Goodman’s professional life began at Marvel Comics, which his father, Martin, founded. Charles Goodman organized his own company, GCR Publishing, in 1974 and was its president until his death. GCR publishes 80 magazines that deal with a variety of subjects, including women’s health and fitness and home decoration. He was a director of the Media Coalition, a trade association of book and magazine distributors, and the Postgraduate Center for Mental Health, a New York-based psychoanalytic training institute that also provides housing and counseling for the homeless and others. He also supported the Anti-Defamation League, the American Civil Liberties Union and the National Organization for Women. Go figure. Even liberals want to make a buck. Brings back fond memories, Derek, of standing on State Street in Jackson, Mississippi in the late eighties with Marnie, holding a homemade sign that said LOOSE CANNON as several black limousines rolled into the parking lot of the upscale Primos restaurant. Ollie was speaking at a fundraiser, and as the other cars rolled in, a scowling dude in a suit gave our group (less than a dozen of us) the unambiguous finger. Marnie said, “That was my childhood best friend’s father!” Those were the days.